Very useful to track different visits from various medium, sources. For example on the page [great barrier reef](http://divezone.net/great-barrier-reef.htm) a piwik user uses it to track twitter VS facebook VS standard search engine results VS adwords! hi, i searched for a way to track links from a newsletter this way an it does it fine for me! ?piwik_campaign won't work anymore. got any idea for a solution ? heinetz: please don't use Trac for technical support questons. I believe I've answered your question in the forum already. You can use campaigns to monitor how effective links you send out through things like your email list or twitter. Campaigns allow you to add an extra bit of information to any link you make to your site that will let Piwik recognize visitors who have followed that link. For example, you launch a big marketing campaign for summer. Instead of sending out links http://example.org/ you would send out a link to http://example.org?piwik_campaign=summer. To add a little more precision to the tracking you can specify different channels for your campaign by adding a second parameter so your link might read http://example.org?piwik_campaign=summer&piwik_kwd=newsletter. You do not have to use x and y. You can use whatever is convenient for you. Adds links to the tracking campaigns & URL builder directly on the Campaigns report in Piwik. 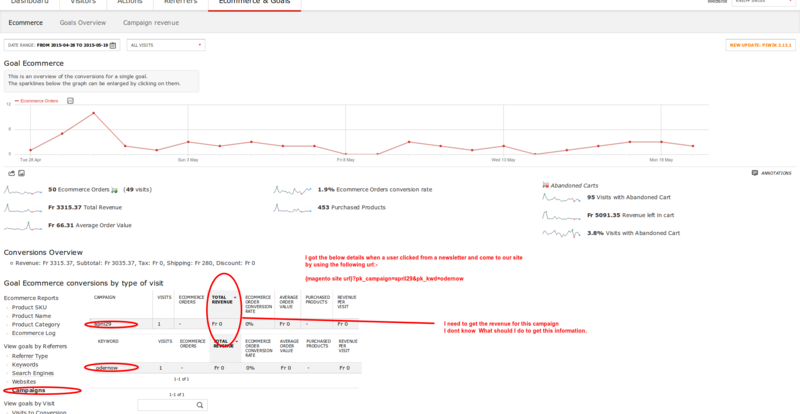 New FAQ: "Does Piwik support Google Analytics campaign parameters (utm_campaign, utm_medium, utm_source, utm_term)?" New FAQ: "How do I customize the Piwik Campaign parameters pk_campaign and pk_kwd?" I need to get the revenue from the newsletter campaign in the shopping site (built in magento). I am getting the visitor counts in piwik, But not able to get the revenue from each newsletter campaign in piwik. Can anybody help me to do it. You mean , I need to go to "Ecommerce & Goals" tab in piwik, And select "View goals by Referrers " , there I can see the Campaigns section. There the number of visitors is showing correctly, But I am not getting the revenue. I have not created any goals manually. Is there any need to create goal by me? Now the click status is showing correctly, but I dont know how to track the revenue , if they have brought anything from the magento shop site. I have attached a screenshot from my piwik insttalation where I am checking the campaign status. I am using a magento site for ecommerce activities , and we are sending newlstters to our customers. I need to get the revenue I got from each newsletter , when they came to the site by clicking the urls in the newsletter and when they purchase a product. I hope it is clear for you. Also I have enabled ecommerce for my magento site and installed piwik ecommerce extension in my site. This is the piwik code which is on the source code of the success page after the order is placed. My current piwik version is 2.1.0 . Should I need to upgrade this? If I upgrade will I get the total revenue from each newsletter I send out? I have piwik ( version : 2.13.1) installed. I am using a magento store. I have installed piwik ecommerce tracking extension in magento to track the ecommerce order in piwik. I also managed to get the revenue from campaign too. But after one month , it stopped working. to track the campaign revenue, and it was working fine.But now the revenue is not tracking, only the number of visits is showing. Could you please help me. I need to solve it asap.